It's always a good idea to take the time to thank the people you meet with during a job interview. What's the best way to show your appreciation for the interviewer's time? Your thank-you note or email doesn't need to be lengthy, but it should reiterate your interest in the job, remind the interviewer of your key qualifications, and relay your thanks for being considered for the position. 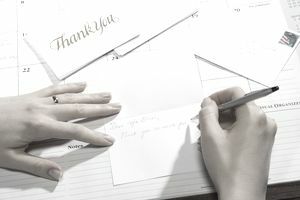 Review an example of a short and simple thank-you note example you can send (via email or mail) after an interview, tips for who you should thank, and advice on how to write a note that makes a great impression. This is a job interview thank-you note sample. Download the thank-you note template (compatible with Google Docs and Word Online) or see below for more examples. I appreciate your taking the time yesterday to speak with me regarding the Position at Company Name. Thank you both for speaking with me and for giving me a tour of your office so that I could meet your other team members. After the interview, I have a better understanding of what the responsibilities and opportunities are in the position. I was particularly interested to learn about the diverse skillset you are seeking in your next [insert Position title], and I believe that my knowledge and goals are very compatible with the needs you outlined. It was a pleasure to talk with you; I left our interview with an even stronger interest in joining your team at Company Name. Please contact me if you have any additional questions for me. Thank you for your time and consideration. If you meet a lot of people during your interview, should you thank them all for their time? It’s not an absolute requirement to send each person a thank-you note or email. In some cases, particularly if you were interviewed by a multi-member panel of interviewers, it is acceptable to send your note to the point person who orchestrated your interview, requesting that he or she share your thanks with the other interviewers. However, even though it takes a little extra time, you will make the most favorable impression if you communicate directly with each member of the interviewing team. Since your follow-up communication should do more than simply thank your interviewers, you should make sure your message is conveyed to all the people who might have a say in the hiring decision as a reminder of your strengths as a job candidate. Ideally, your note or email should include an expression of strong or enhanced interest in the job after meeting with the interview team. In addition, incorporate a concise statement regarding why you think the position is an excellent fit, as well as an expression of gratitude for their time and input. You can also add any information about your qualifications that you neglected to share during the meeting. Here’s more information about how to write a thank you note for a job interview. Want to make an extra positive impression on your interviewers? Incorporate a different sentence into each communication referencing something specific of interest that the interviewer shared or a concern that she emphasized through her questioning. Your follow-up communication should be sent immediately after the interview so that it arrives prior to the completion of candidate evaluations. Either an email or even a hand-delivered thank-you card is usually the timeliest means of communicating. If you know you have time, a mailed thank-you letter or card is another option. Prepare in advance for following up after an interview by asking for business cards or contact information for the people you meet with. You can ask them as you meet them or ask the person who arranged the interview if they can provide this information. Make sure you get the proper titles and email addresses for each of your interviewers prior to the end of your interview day so you can expedite your follow-up letter.